Americans are not using their vacation days. Last year Americans left 662 million vacation days unused- 206 million of those days were forfeited- lost forever. Wouldn’t you rather have those workers spending their money in your community instead of the office snack machine? So why are American workers—especially Millennials—so bad at taking a break? Blame it on the fact that many are just starting their careers and are eager to impress. Blame their smaller budgets. But mostly, blame the internet. Because employees can always log on, they’ve forgotten how to log off. 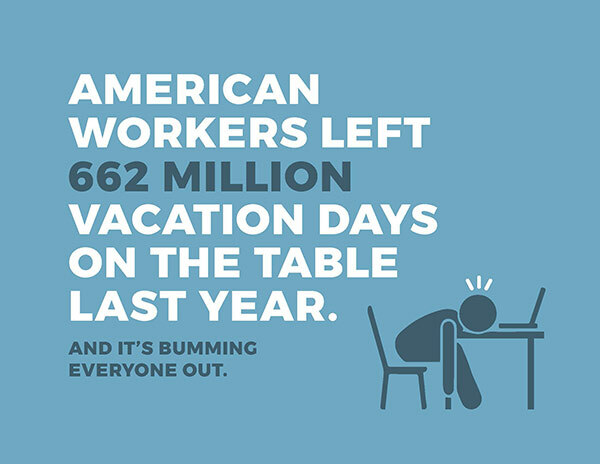 Last year alone, 54% of workers didn’t use all their vacation time. The irony is that if they had stepped away from their laptops to hit the beach or take a hike, they would be more creative, more productive and more likely to get a promotion. If something isn’t done to help Millennials recognize the importance of vacation, there could be a negative ripple effect when this generation ascends to positions of power within their companies. Think about what an extra day of tourism income could do for your locality. Brand-new facilities. Beautiful public spaces. Amazing community programs. More money in your marketing budget. Maybe some free donuts just for fun. The possibilities are truly endless as we know travelers spend $65 million a day in Virginia.